At "The Homestead," children will know what it's like to work from morning until night like the pioneers as they push a plow in a field, bend metal with a blacksmith vise and sharpen plastic knives on a grinding stone. Other tasks for the children will be drilling holes with an auger, weighing bags of "gold" with a steelyard, cranking and casing sausage, working a butter churn and making strawberry pies for dinner. 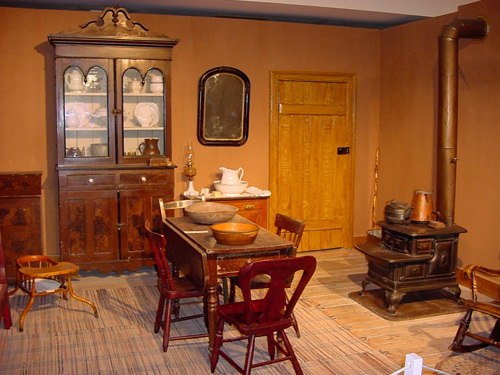 When families complete their work at "The Homestead," they can view pioneer furniture and artifacts in cases. The pieces were either brought across the plains or made in the Brigham City area between 1860 and 1880. Some of the items on display are a pair of wooden ice skates, a straw splitter to make straw hats and an early English scale.